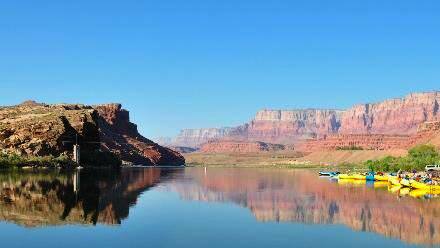 Marble Canyon, Arizona is where you will meet our guides the morning of your river trip. (Marble Canyon is 500 miles from any large cities with international airports, and lodging in Marble Canyon is very modest. 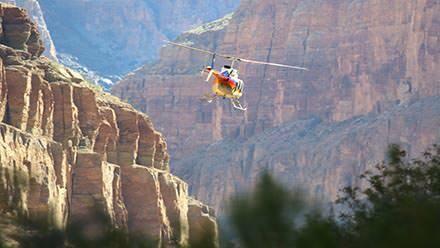 Therefore, most of our guests arrive in Las Vegas and opt for the charter flight cost that brings them to Marble Canyon the morning of river trip departure). In the morning, your guides will meet you at 7:30 AM at the Marble Canyon Airstrip just across the street from the Marble Canyon Lodge. You should be dressed for the river, have your duffle bag packed, and your vehicle parked in the long-term parking area. 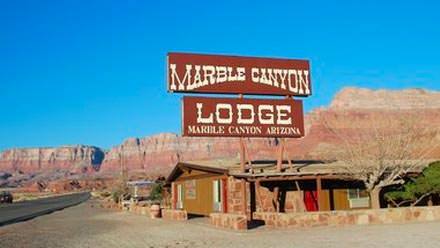 Modest accommodations are available at the Marble Canyon Lodge and may be booked online or by calling (928) 355-2225. Mention that you are a Western River guest and request our discount. Reservations begin January 1st of the year in which you are traveling. Make reservations promptly as the property does fill. There is a restaurant on the property. If you would rather take a 4.5 hour shuttle from Las Vegas, rather than the charter flight the morning of your trip, you might consider using Bar 10 Transportation Services. Call (800) 582-4139 for reservations. The ground shuttle leaves from the Las Vegas airport the day prior to your trip. Return flight to Las Vegas (after your river trip) is provided at no additional cost when using Bar 10 Transportation Services - You MUST advise Western River Expeditions if you wish to use this service. Long term parking at Marble Canyon Lodge is free, and is located across the street from the Lodge, near the airstrip. Take care that anything you leave in the vehicle will be subject to extreme Arizona temperatures, often exceeding 100° degrees. Electronics, chap stick, chocolate bars, soda cans... Marble Canyon Lodge will not store anything for you, including car keys. Either pack them safely in your duffle bag, or remember which rock you hide them under! You will want to explore your surroundings at Marble Canyon. Below are recommendations, in order of time available the day before (or after) your river trip. 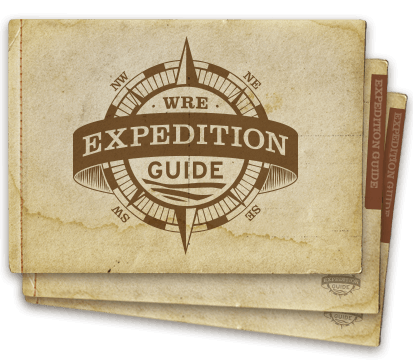 This is a place you will naturally take advantage of when you check-in and wander around, but don't overlook the reading area they have provided. The library of books available here is fairly unique - not that you can't find them anywhere else online, etc. but the topics and titles you'll find there are so uniquely engrained into the area that you will find inspiration in just a casual browsing. Don't forget that you will be back here AFTER your river trip and you may have a whole new perspective on the contents of those books. Want a sneak peek of the canyon you'll be traveling by river the next morning? A very short drive south from Marble Canyon Lodge you will find the highway crossing over Marble Canyon itself - about 800 feet below. No doubt you will want to slow down and get a good look, so continue to the south side parking lot where you can get out and stroll easily on Navajo Bridge. Look for: (1) California Condors re-introduced to the area in 1996. (2) Boats and rafts drifting below. Most pass by before lunchtime. (3) Observe the narrowness of the bridge you are walking on... Imagine cars and semi-trucks passing on this narrowly constructed bridge. 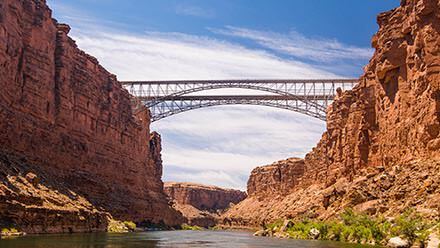 Marble Canyon Bridge was built in 1995 to alleviate modern traffic flow - and now you get to walk Navajo Bridge, built in 1929. (4) The south rim is Navajo Indian Reservation where they sell native crafts. 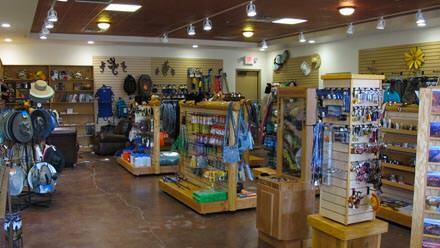 The north rim is federal with a visitor center/bookstore. A seven mile paved road from Marble Canyon leads to Lee's Ferry. It's a dead end as far as the road goes, but it is a place of confluence for many wonderful comings and goings beyond the road. Fishermen cruise 15 miles upstream to the dam at Lake Powell, tour groups drift down from the dam, and EVERY river trip ever taken through the 277 miles of Grand Canyon has begun right there at Lee's Ferry. You may see boats rigging for their turn to launch the next day. Look for: (1) The view of the Vermillion Cliffs from the river's edge, looking downstream is fairly unique among the many spectacular views you'll be seeing on your trip, so soak that up. (2) Lee's Ferry was the only crossing for 500 miles until Navajo Bridge was built in 1929. Look for the dirt road on the far bank, leading downstream. (3) The rock layers you see all around you at Lee's Ferry are much younger (Jurassic & Triassic) than the ones you'll slice through in the Grand Canyon. (4) Take the time to read the various historical and interpretive signs. If you have half an hour before leaving the Lee's Ferry area, you may want to hang a right hand turn (on your way out) and go a short distance toward Lonely Dell. 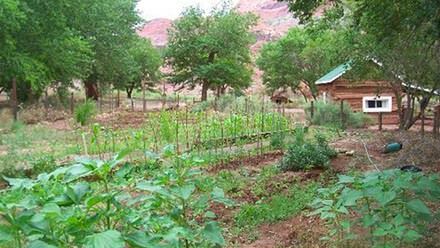 You'll walk amongst the historic cabins and orchards of John D. Lee and his several wives who established the ferry and homestead beginning in 1873.